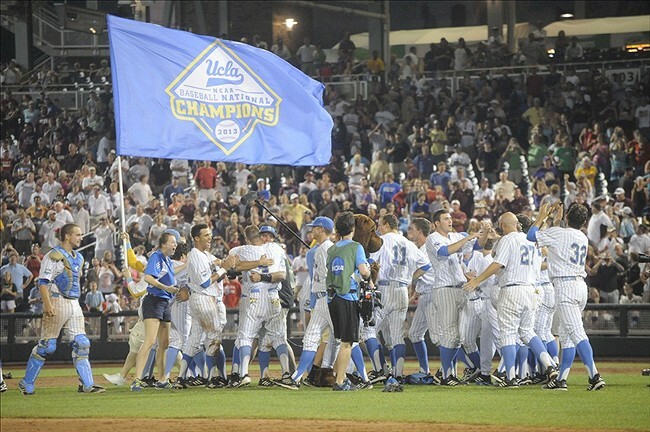 2013 was quite the year for UCLA baseball as the Bruins made their third College World Series in four years and won their first ever baseball national championship. Coach John Savage and the boys will try to make it back-to-back in 2014. But to do so they will have go through a tough out-of-conference schedule in addition to their always brutal Pac-12 play. 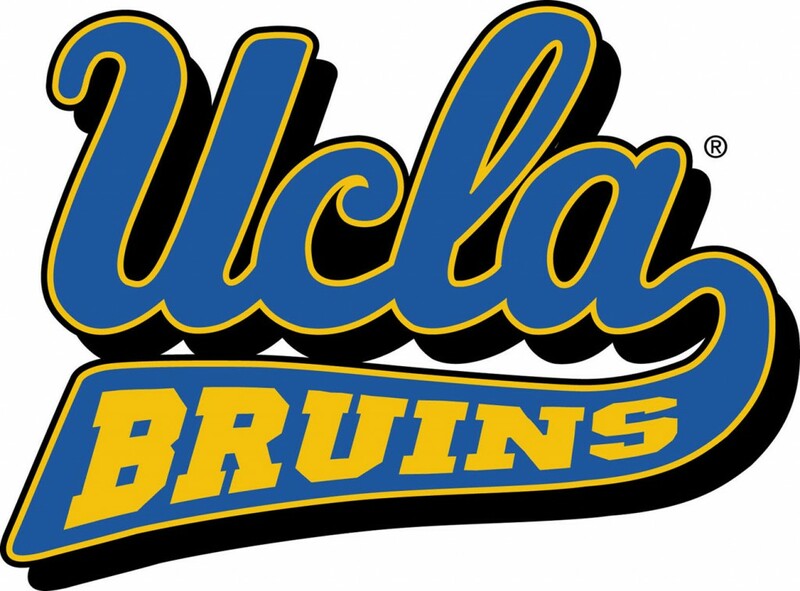 The 2014 UCLA baseball schedule is below. Highlights of their non-conference schedule include the Notre Dame classic in Cary, N.C. and the annual Dodgertown Classic, which takes place between March 7th and March 9th. Pac-12 games are indicated with an *. Feb. 14 Portland Jackie Robinson Stadium 6:00 p.m.
Feb. 15 Portland Jackie Robinson Stadium 2:00 p.m.
Feb. 16 Portland Jackie Robinson Stadium 1:00 p.m.
Feb. 18 Cal State Northridge Jackie Robinson Stadium 6:00 p.m.
Feb. 21 Cal Poly Jackie Robinson Stadium 6:00 p.m.
Feb. 22 Cal Poly Jackie Robinson Stadium 2:00 p.m.
Feb. 23 Cal Poly Jackie Robinson Stadium 1:00 p.m.
Feb. 25 UC Santa Barbara Jackie Robinson Stadium 6:00 p.m.
Feb. 28 Notre Dame Cary, N.C. 3:30 p.m.
March 1 North Carolina State Cary, N.C. 3:30 p.m.
March 2 Michigan Cary, N.C. 9:00 a.m.
March 4 Loyola Marymount Jackie Robinson Stadium 6:00 p.m.
March 5 Waseda University (Japan) (Exh.) Jackie Robinson Stadium 5:00 p.m.
March 7 Pepperdine Jackie Robinson Stadium 6:00 p.m.
March 8 Houston Jackie Robinson Stadium 2:00 p.m.
March 11 UC Irvine Jackie Robinson Stadium 6:00 p.m.
March 14 at California* Berkeley, Calif. 7:00 p.m.
March 15 at California* Berkeley, Calif. 6:00 p.m.
March 16 at California* Berkeley, Calif. 1:00 p.m.
March 21 Washington State* Jackie Robinson Stadium 6:00 p.m.
March 22 Washington State* Jackie Robinson Stadium 2:00 p.m.
March 23 Washington State* Jackie Robinson Stadium 1:00 p.m.
March 25 Long Beach State Jackie Robinson Stadium 6:00 p.m.
March 28 Arizona State* Jackie Robinson Stadium 6:00 p.m.
March 29 Arizona State* Jackie Robinson Stadium 2:00 p.m.
March 30 Arizona State* Jackie Robinson Stadium 1:00 p.m.
April 1 at Loyola Marymount Los Angeles, Calif. (LMU) 6:00 p.m.
April 4 at Long Beach State Long Beach, Calif. 6:00 p.m.
April 5 Long Beach State Jackie Robinson Stadium 2:00 p.m.
April 6 at Long Beach State Long Beach, Calif. 1:00 p.m.
April 8 at Cal State Fullerton Fullerton, Calif. 6:00 p.m.
April 11 at Arizona* Tucson, Ariz. 6:00 p.m.
April 12 at Arizona* Tucson, Ariz. 6:00 p.m.
April 13 at Arizona* Tucson, Ariz. 12:00 p.m.
April 17 at Utah* Salt Lake City, Utah 6:00 p.m.
April 18 at Utah* Salt Lake City, Utah 6:00 p.m.
April 19 at Utah* Salt Lake City, Utah 12:00 p.m.
April 22 Loyola Marymount Jackie Robinson Stadium 6:00 p.m.
April 25 USC* Jackie Robinson Stadium 6:00 p.m.
April 26 USC* Jackie Robinson Stadium 2:00 p.m.
April 27 USC* Jackie Robinson Stadium 1:00 p.m.
April 29 at UC Santa Barbara Santa Barbara, Calif. 3:00 p.m.
May 2 Stanford* Jackie Robinson Stadium 6:00 p.m.
May 3 Stanford* Jackie Robinson Stadium 2:00 p.m.
May 4 Stanford* Jackie Robinson Stadium 1:00 p.m.
May 6 Cal State Fullerton Jackie Robinson Stadium 6:00 p.m.
May 9 at Oregon State* Corvallis, Ore. 5:30 p.m.
May 10 at Oregon State* Corvallis, Ore. 2:00 p.m.
May 11 at Oregon State* Corvallis, Ore. 1:00 p.m.
May 13 at UC Irvine Irvine, Calif. 6:30 p.m.
May 16 Oregon* Jackie Robinson Stadium 6:00 p.m.
May 17 Oregon* Jackie Robinson Stadium 2:00 p.m.
May 18 Oregon* Jackie Robinson Stadium 1:00 p.m.
May 23 at Washington* Seattle, Wash. 5:00 p.m.
May 24 at Washington* Seattle, Wash. 2:00 p.m.
May 25 at Washington* Seattle, Wash. 1:00 p.m.